The immunological basis by which a mother tolerates her semi-allogeneic fetus remains poorly understood. Several mechanisms are likely to contribute to this phenomenon including active immune regulation by regulatory T cells. In this article, we report that human placental trophoblasts activate a clonal population of CD8+ T cells with regulatory function. These cells are not MHC class I restricted, but require costimulation through a member of the carcinoembryonic Ag family present on early gestation trophoblasts. These regulatory T cells express the mucosal markers CD101 and CD103 and display selective usage of the TCR gene Vβ9. CD8+ T cells isolated from the peripheral blood of pregnant mothers (16–28 wk) also demonstrate expansions in the same Vβ family (Vβ9), signaling a possible role for these cells in preventing fetal rejection in vivo. We have previously characterized a subset of CD8+ regulatory T cells activated by the combination of the nonclassical class I molecule CD1d and a costimulatory molecule of the carcinoembryonic Ag family present on the intestinal epithelium. These data support the concept that distinct regulatory T cell populations exist at different sites and may be regulated locally by unique restriction elements, costimulatory signals, and Ags. Allogeneic tissue grafts are typically rejected rapidly and require exogenous immunosuppressive medications to be tolerated. In contrast, the human fetus, which resembles a semi-allogeneic graft, is accepted by the maternal immune system in the majority of cases without intervention. Potential mechanisms underlying this phenomena are likely to be complex (1). Anatomically, placental trophoblasts occupy a unique position at the interface between mother and child. These epithelial cells possess several intriguing features that suggest a role for these cells in preventing fetal rejection. Trophoblasts express little or no classical MHC class I (HLA-A, -B, and -C) (2, 3, 4, 5), but do express a number of nonclassical MHC class I molecules. Examples include HLA-E (6) and HLA-G (7, 8), which can modulate the innate immune response and prevent NK (6) and NK T cell (9)-mediated cytotoxicity. Additionally, trophoblasts have been recently shown to express the nonclassical MHC class I molecule, CD1d, on the surface of first-trimester human trophoblasts (10). We have previously described a subset of CD8+ regulatory T cells in humans that is restricted by CD1d and a costimulatory molecule of the carcinoembryonic Ag (CEA)3 family expressed on intestinal epithelial cells (IEC). These cells use a restricted TCR repertoire (Vβ5.1/Vα18), are CD28−, and can suppress immune responses in vitro (11). In the intestine, these cells may play an important role in controlling inflammatory responses to normal commensal flora at the interface between the external environment and the mucosal immune system. Interestingly, patients with inflammatory bowel disease are deficient in the expression of the CEA subfamily costimulatory molecule, which correlates with an inability of these patients to be tolerized to orally administered Ags (12). Regulatory T cells (reviewed in Ref.13) comprise a heterogeneous class of cells that suppress immune responses via cognate interactions (CD4+CD25+), soluble factors such as TGF-β or IL-10 (Th3 and Tr1 cells, respectively), or some combination of the two. These cells appear to play a role in controlling inflammatory immune responses in a number of settings including autoimmune and chronic inflammatory diseases. Recently, a role for regulatory T cells has been demonstrated in maintaining fetal tolerance as well. CD4+CD25+ regulatory T cells play a critical role in mice during pregnancy after allogeneic matings (14). In humans, CD4+CD25+ cells expressing the regulatory transcription factor FoxP3 (15), OX-40, and glucocorticoid-induced TNFR family-related gene are expanded in the peripheral blood as well as at the maternal-fetal interface (16), implying an important role for these cells in fetal tolerance. In this report, we show that trophoblasts can activate a subset of CD8+ T cells that are independent of classical MHC class I but are dependent upon a CEA subfamily member. These T cells have a restricted TCR repertoire, coexpress the mucosal markers CD101 and CD103, and demonstrate in vitro regulatory properties. Finally, we provide evidence that these CD8+ T cell subsets are expanded in the peripheral blood of pregnant mothers, suggesting a potential role for these cells in vivo. Placentae from 7- to 18-wk elective abortions performed at the Mount Sinai Medical Center or full-term (38–40 wk) pregnancies were collected in accordance with the Mount Sinai Institutional Review Board guidelines. Trophoblasts were isolated as described previously (17, 18), with modifications. Briefly, placental specimens were washed twice in PBS, and membranes were manually removed. The placenta was then digested in PBS containing 1.5 mg/ml Dispase (Roche Applied Science) and 300 μg/ml DNase I (Calbiochem) for 15 min at 37°C with gentle agitation. Supernatants were harvested and layered on FCS (Omega Scientific) and centrifuged for 15 min at 1200 × g. Pellets were resuspended in PBS and layered on a discontinuous Percoll density gradient (25/45/60%) and centrifuged for 20 min at 1200 × g. Trophoblasts were isolated from the 25/45% Percoll interface and washed twice in AIM-V serum-free medium (Invitrogen Life Technologies). In some cases, cells were preincubated with Abs against CD1d (mAb D5, MsIgG2b; a kind gift from Drs. R. Blumberg (Brigham and Women’s Hospital, Boston, MA) and S. Balk (Beth Israel Deaconess Medical Center, Boston, MA)), gp180 (mAb B9, MsIgG1; see Ref.19), pan-MHC-I (W6/32, MsIgG2a), or isotype controls (BD Pharmingen) for 60 min at 4°C. Excess Ab was removed by extensive washing in PBS before coculture. Blood from pregnant and nonpregnant donors was obtained with informed consent. Three to 5 ml of heparinized whole blood was subjected to RosetteSep (StemCell Technologies) separation to isolate T cells (purity >95%) according to the manufacturer’s instructions. A total of 2 × 106 T cells was labeled with CFSE (Molecular Probes) (20) and cultured with 1 × 106 freshly isolated trophoblasts (described above) in AIM-V serum-free medium (Invitrogen Life Technologies) for up to 7 days at 37°C, with 5% CO2. CD4+ and CD8+ proliferating (CFSElow) and nonproliferating (CFSEhigh) T cells could be determined by flow cytometry. The data are presented as the percentage of CD8+ T cells proliferating in the cultures (CD8+CFSElow/total CD8+ T cells). Cells were washed twice in PBS/1% BSA (Sigma-Aldrich). For phenotypic studies, CFSE-labeled T cells were stained with mAbs against CD3(-PerCP), CD8(-allophycocyanin), and one of the following Abs: IgG control(-PE), CD101(-PE), CD103(-PE), CD28(-PE), CTLA-4(-PE), or CD178(-PE) (all from BD Pharmingen). For TCR repertoire studies, cells were stained with Abs against various TCR-Vβ family members conjugated to PE (Immunotech), CD3(-PerCP), and CD8(-allophycocyanin) (BD Pharmingen). Cells were analyzed on a FACSCalibur (BD Immunocytometry Systems) or sorted on a FACSVantage machine at the Mount Sinai Flow Cytometry Core. Proliferating and nonproliferating CD8+ T cells, as determined by CFSE staining, were sorted and lysed in TRIzol (Invitrogen Life Technologies). Total RNA was isolated according to the manufacturer’s instructions (Invitrogen Life Technologies). RT-PCR was performed using primers specific for human Vβ genes described elsewhere (21) and a fluorescently labeled constant TCR β-chain primer. Products were run on an ABI 377 sequencer and analyzed with Genotyper software (Applied Biosystems). Isolated trophoblasts were lysed in TRIzol reagent (Invitrogen Life Technologies), and total RNA was collected according to the manufacturer’s instructions (Invitrogen Life Technologies). One microgram of total RNA was reverse transcribed into cDNA. Real-time PCR was performed on the Roche LightCycler using the FastStart SYBR Green kit (Roche) and the following conditions: CD1d primers, 5′-GCAACGACTCGGACAC-3′ and 5′-CTGTTTCCCTCGTCCA-3′. PCR conditions were as follows: touchdown PCR was performed according to the following protocol: 1) 95°C for 10 min (enzyme activation); 2) 95°C for 5 s (denaturation); 3) 63°C for 5 s for the first 10 cycles, a 0.5°C temperature decrease over the next 16 cycles to a final annealing temperature of 55°C for 26 additional cycles (a total of 55 cycles); and 4) 72°C for 14 s (extension). Samples were run in duplicate. Quantitation was performed by second derivative maximum analysis. PCR product size was confirmed by gel electrophoresis. Whole placentae or isolated trophoblasts (see above) were lysed in 1% digitonin lysis buffer containing 300 mM NaCl, 50 mM HEPES, 2.5 mM EDTA, and protease inhibitor mixture (Complete Mini; Roche) on ice for 4–6 h. Lysates were centrifuged at 12,000 × g for 10 min. Supernatants were mixed with 4× SDS-loading buffer (100 mM Tris, 4% SDS, 0.2% bromphenol blue, and 20% glycerol) and resolved on 8% SDS-polyacrylamide gels. After transfer to nitrocellulose membranes, these were blocked with 5% dry milk/PBS overnight at 4°C. Primary Abs were incubated for 2 h at room temperature, and then washed with PBS containing 0.1% Tween 20 (Fisher Scientific). Secondary Ab (goat anti-mouse-HRP conjugate; Invitrogen Life Technologies) was incubated for 2 h at room temperature. After extensive washing, blots were developed with SuperSignal (Pierce). Placentae were washed twice in sterile PBS. Specimens were then snap frozen in OCT compound (Miles) in liquid nitrogen. Eight-micrometer frozen sections were cut and immediately fixed in 4% PBS-buffered formalin overnight. Sections were rinsed briefly in PBS, and the tissue was outlined by an ImmEdge hydrophobic pen (Vector Laboratories). Nonspecific-Ab activity was blocked with normal horse serum for 30 min at room temperature. Slides were incubated with 10 μg of either the B9 mAb or isotype control (IgG1; BD Pharmingen) for 2 h at room temperature. Biotinylated secondary Abs and streptavidin-HRP from the Vectastain ABC (avidin-biotin complex) kit was added (Vector Laboratories) for 45 min at room temperature. Slides were developed with diaminobenzidine (DakoCytomation), counterstained with hematoxylin (Fisher Scientific), and mounted with Vectashield (Vector Laboratories). Trophoblast-activated T cells were sorted, as described in Flow cytometry and sorting, into proliferating and nonproliferating (based on CFSE staining) CD8+ and CD4+ fractions. These cells were added to fresh PBMC (1 × 105 cells/well), isolated from healthy volunteers stimulated with 1% PWM (Sigma-Aldrich). Cell ratios (E:T ratio) varied between 1:2 and 1:8. All conditions were performed in triplicate. After 7 days, supernatants were collected, and secreted Ig was determined by ELISA. In some experiments, sorted cells were separated from PWM-stimulated PBMC by a Transwell filter (Falcon). In other experiments, these fractions were irradiated 2500 rad (cesium source) and cocultured in a nonrelated allogeneic MLR culture at a 1:1 and 1:2 (effector CD8+ or CD4+ to responder T cell) ratio. [3H]Thymidine (MP Biomedical) incorporation was measured after 5 days of culture. Inhibition, expressed as a percentage of the control MLR, was calculated by the following formula: % of control = (MLR + effector T cell)cpm/MLRcpm × 100. IFN-γ and IL-10-cytokine ELISA was performed using the OptEIA kit (BD Pharmingen) according to the manufacturer’s instructions. All samples were run in triplicate. For Ig detection, 96-well plates were coated with goat anti-human polyspecific Ab (BioSource International) at a concentration of 6.25 μg/ml in 15 mM sodium carbonate/35 mM sodium bicarbonate buffer overnight at 4°C. Nonspecific binding was blocked with PBS/0.5% Tween 20/1% BSA for 1 h at room temperature. Samples were diluted 1/10 and 1/40 in PBS/0.5% Tween 20 and incubated at room temperature for 2 h. After incubation, goat anti-human κ and goat anti-human λ Abs conjugated to alkaline phosphatase (BioSource International) were added at a concentration of 0.7 μg/ml each. Plates were developed with p-nitrophenyl phosphate (Sigma-Aldrich) in substrate buffer (9.7% diethanolamine, 0.5 μM MgCl-6H2O (pH 9.8)). Plates were read on a uQuant (Bio-Tek Instruments) microplate reader (650 nm for cytokines and 405 nm for Ig) and analyzed with KC4 software (Bio-Tek Instruments). For TGF-β ELISA (Quantikine; R&D Systems), 200 μl of culture supernatants or culture supernatants treated with 1 N HCl to activate latent TGF-β were added to precoated 96-well plates and incubated for 3 h at room temperature. Plates were washed three times, and the detection Ab was added and incubated for an additional 1.5 h. Plates were washed three more times, and 200 μl of substrate solution was added. After 20 min, 50 μl of stop solution was added, and the absorbance of the samples at a wavelength of 450 nm was determined. Cells from trophoblast cocultures or cells from a conventional MLR were pretreated with OKT3 (1 μg/ml) or IgG2a isotype control Ab (1 μg/ml) for 1 h at room temperature and used as effector cells. FcR-expressing P815 cells labeled with 51Cr were used as target cells in a redirected lysis assay. Triplicate wells of effector cells were incubated with 5 × 103 labeled P815 targets in different ratios in V-bottom plates (Nunc) for 4 h at 37°C, with 5% CO2. After incubation, 100 μl of culture supernatant was harvested, and the amount of released 51Cr in each triplicate sample was assayed by gamma counter. Spontaneous release of 51Cr was measured by incubating P815 cells alone, whereas maximal release was determined by solubilizing labeled P815 cells in 1% Triton X-100. Specific lysis was calculated by the following formula: Percent specific lysis = (51Cr released − spontaneous 51Cr)/(maximal 51Cr release − spontaneous 51Cr) × 100. Trophoblasts express a number of nonclassical class I molecules, including HLA-E (6), HLA-G (7, 8), MICA/B, and the neonatal FcR (22). We have previously characterized a subset of CD8+ regulatory T cells in the intestine that require a complex of the nonclassical class I molecule, CD1d, and a costimulatory molecule of the CEA subfamily for activation (11, 23). In agreement with previous data showing the expression of CD1d on human trophoblasts (10), quantitative PCR of mRNA isolated from human trophoblasts showed increasing CD1d transcripts present from gestational age wk 7–12 (Fig. 1⇓A). Trophoblasts express CD1d and a CEA subfamily member. A, Real-time PCR shows the presence of CD1d mRNA as early as 7 wk of gestation. A decrease in the cycle number at which the PCR reaches the log-linear phase signifies an increased mRNA abundance at 10 and 12 wk. Below, Agarose gel electrophoresis confirms the appropriate product size. Positive control is a plasmid containing CD1d. B, Immunohistochemistry showing specific B9 mAb reactivity in preterm trophoblasts (12 wk) and not interstitial tissue. The left panel represents the isotype control. C, Immunohistochemistry showing no B9 mAb reactivity in term placenta. Control staining shows specific reactivity using an Ab against placental alkaline phosphatase (mAb 8B6), but not an isotype control. 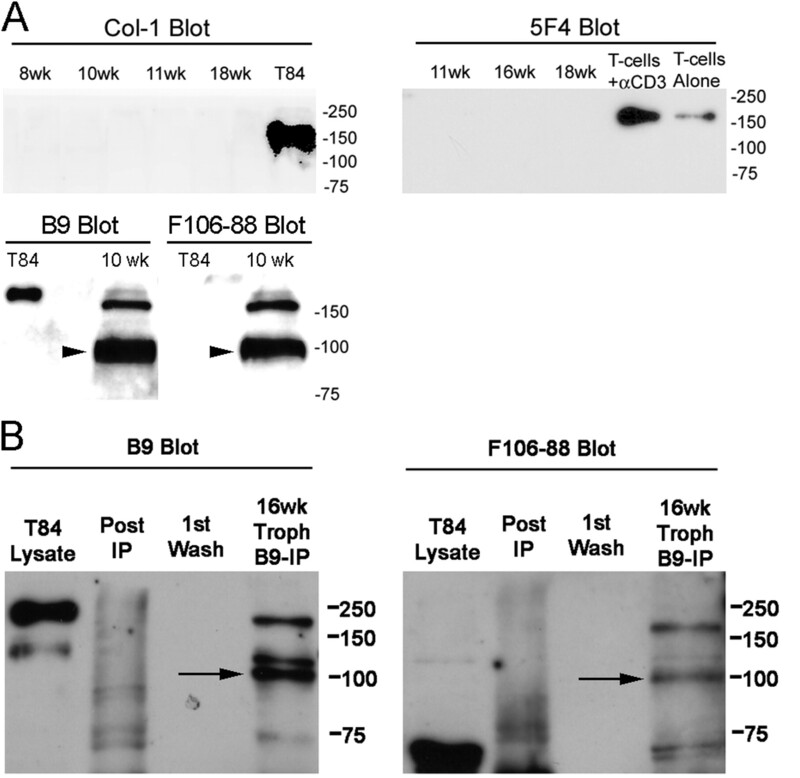 D, Western blot demonstrating B9 mAb immunoreactivity in 7-, 10-, 11-, and 12-wk trophoblasts and an IEC cell line control (lanes 1–5, respectively). To determine whether the costimulatory molecule of the CEA family was also present, placentae were subjected to immunohistochemical analysis using the B9 mAb. The B9 mAb was identified originally by its ability to block the generation of CD8+ regulatory T cells in T cell:IEC cocultures (11). Expression of the epitope recognized by mAb B9 was restricted to intestinal epithelium (19, 23) (not lung or skin) and cortical thymic epithelium. On normal IEC, it recognizes a dominant 180-kDa band by Western blot. Further characterization has shown that the mAb is specific for a shared epitope in the N-domain of number of CEA subfamily members (e.g., CEACAM1, CEACAM3, and CEACAM6). As seen in Fig. 1⇑B, mAb B9 stained trophoblasts from 8- to 12-wk placentae (12 wk shown) but not interstitial tissues. In contrast, no B9 staining was seen in term placenta (Fig. 1⇑C). Western blot analysis of resolved placental lysate revealed a single band with an apparent molecular mass between 80 and 100 kDa (Fig. 1⇑D). Interestingly, this is in contrast to the size of the predominant molecular species of mAb B9-reactive material expressed by the intestinal epithelium, gp180, which is 180 kDa (Fig. 1⇑D, lane 5). Because term placentae do not express CD1d (10) and did not stain with mAb B9 (Fig. 1⇑C), these molecules appear to be induced early in gestation and may be temporally regulated. The presence of both CD1d and a form of the costimulatory molecule of the CEA family recognized by mAb B9, suggested the possibility that CD8+ regulatory T cells might be activated at the maternal/fetal interface (analogous to the intestine). Autologous (from pregnant patients) or allogeneic (from normal volunteers) peripheral blood T cells were labeled with CFSE and cocultured with freshly isolated trophoblasts from 9- to 16-wk placentae. No significant differences in T cell proliferation were observed between cultures using autologous vs allogeneic blood (autologous (n = 6), 24.3 ± 16.6%; allogeneic (n = 34), 35.7 ± 24.9% (p = 0.09)). As seen in Fig. 2⇓A, after 7–9 days of coculture, both proliferating CD4+ T cells and CD8+ T cells can be identified by a decrease in CFSE fluorescence intensity. Similar to T cells cultured with freshly isolated IEC, trophoblasts preferentially activate CD8+ T cells (Fig. 2⇓B) when compared with a conventional MLR. Interestingly, CD4+ T cell expansion appears to occur in the absence of class II expression on trophoblasts. Trophoblasts preferentially expand CD8+ T cells. A, CFSE-labeled CD3+ T cells cocultured with trophoblasts show multiple divisions (decreased CFSE intensity, x-axis) after 7 days. CD8 staining intensity is shown on the y-axis. Both CD8+ and CD8− cells proliferate. B, Trophoblasts (n = 40) preferentially and significantly expand CD3+CD8+ T cells compar ed with the percentage of CD3+CD8+ T cells that proliferate in a conventional MLR (n = 11). ∗∗, p < 0.01. To test the regulatory capacity of these CD8+ cells, proliferating and nonproliferating CD8+ T cells were sorted and cocultured with PBMC stimulated with 1% PWM. Suppression of PWM-induced Ig secretion is a well-established assay for Ag-nonspecific regulatory T cell activity (24) and is particularly useful in detecting the regulation of T cell-dependent B cell differentiation (25). Proliferating CD8+ cells efficiently suppressed the secretion of Ig in these cultures compared with nonproliferating CD8+ T cells and proliferating and nonproliferating CD4+ T cells cells at E:T ratios as low as 1:8 (Fig. 3⇓, A and B). Separating effector CD8+ T cells from target PBMC, via Transwell inserts, completely abrogated suppression, suggesting that the mechanism of suppression is contact dependent (Fig. 3⇓B). In contrast to CD8+ regulatory T cells that our laboratory has characterized previously in the intestine, trophoblast-activated CD8+ T cells were unable to act as third-party suppressor cells in an unrelated allogeneic MLR (Fig. 3⇓C). 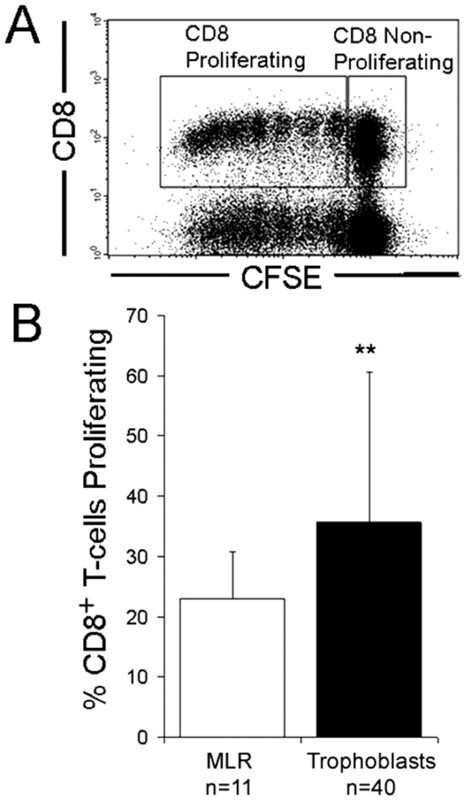 Proliferating CD4+ T cells exhibited no suppressive activity in any assay (Fig. 3⇓, A and C). This may suggest a potential regulatory niche for trophoblast-activated CD8+ regulatory T cells in regulating Ab responses during pregnancy. Regulatory activity of trophoblast-activated CD8+ T cells. A, CD3+CD8+ proliferating T cells in trophoblast cocultures demonstrate in vitro regulatory activity. CD3+CD8+ proliferating T cells, but not nonproliferating CD8+ T cells, efficiently (>80% suppression at 1:2 and 1:4 E:T ratios) suppress Ig secretion by PWM-stimulated PBMCs. In contrast, CD4+ T cells do not suppress Ig secretion at similar E:T ratios. This figure is representative of five experiments with similar results (∗∗, p < 0.01). B, Sorted CD3+CD8+ T cells were added to PBMCs stimulated with 1% PWM at 1:4 and 1:8 E:T ratios. Effector cells were either added directly to target PBMCs or separated from target cells by a Transwell filter. Supernatants were collected after 7 days and analyzed by ELISA for total Ig. CD3+CD8+ proliferating T cells in trophoblast cocultures efficiently (>75% at 1:4 and 1:8 E:T ratios) blocked the secretion of Ig by PWM-stimulated PBMCs. This inhibition is contact dependent because the effect is completely abrogated by separating the effector and target cells by a Transwell filter. Nonproliferating CD8+ T cells also can inhibit Ig secretion (35% inhibition at E:T ratio of 1:8) (∗∗, p < 0.01; ∗, p < 0.05). C, Trophoblast-activated T cells do not act as third-party suppressor cells in an allogeneic MLR. Trophoblast-activated T cells were sorted into proliferating and nonproliferating CD4+ and CD8+ T cells as described in Materials and Methods. A total of 2 × 105 irradiated trophoblast-activated T cells was added in the indicated ratios to unrelated allogeneic MLRs in 96-well plates. Plates were incubated for 5 days, and 1 μCi of [3H]thymidine was added during the last 18 h of culture. [3H]Thymidine incorporation was measured by scintillation counting. Inhibition, expressed as a percentage of the control MLR, was calculated by the following formula: % of control = (effector + MLR)cpm/(MLR alone)cpm × 100%. p = no significant differences. To define the mechanism of suppression, we initiated a series of additional studies. Given the dependence upon cell contact for trophoblast-activated CD8+ T cell-mediated regulatory activity, one possibility is that the proliferating CD8+ T cells mediate their suppression via cytotoxicity. To test this possibility directly, we radiolabeled FcR-expressing P815 target cells with 51Cr and used these cells as targets for our trophoblast-activated T cells in a redirected lysis assay. Total cytotoxic activity was measured by cross-linking CD3 using the OKT3 mAb or an IgG2a isotype control. As seen in Fig. 4⇓, T cells activated in a conventional MLR exhibited dose-dependent lytic activity. In contrast, trophoblast-activated T cells did not show any appreciable cytolytic activity at the same E:T ratios. This suggests that the mechanism by which trophoblast-activated T cells suppress inflammatory immune responses is not likely to be mediated through cytotoxic effects. ). This figure is representative of three experiments with similar results. Other contact-dependent regulatory T cells have been shown to enhance their activity via cytokine production. For example, naturally occurring CD4+CD25+ regulatory T cells use a combination of IL-10 and TGF-β to suppress immune responses. IL-10 is a pleotropic cytokine with well-known immunosuppressive properties. The regulatory T cell subsets Tr1 and, to a lesser extent Th3 cells, use IL-10 to help mediate suppression. As shown in Fig. 5⇓, supernatants from cocultures of trophoblasts with peripheral blood T cells demonstrate a significant increase in IL-10 compared with T cells or trophoblasts alone (Fig. 5⇓A). This increase was most significant at 48 h but was evident at 24 h (data not shown). In contrast, neither IFN-γ nor TGF-β were detectable in the same supernatants (Fig. 5⇓, B and C). Cytokine secretion of trophoblast-activated CD8+ T cells. Trophoblast/T cell cocultures (n = 5) secrete IL-10 but not IFN-γ or TGF-β. T cells were cocultured with trophoblasts for 48 h. Supernatant was collected and analyzed by ELISA. Trophoblast/T cell cocultures had significantly increased levels of IL-10 (A), but had nondetectable levels of IFN-γ (B) (∗, p < 0.05). C, Before activation with 1 N HCl, TGF-β was undetectable in culture supernatants. We next characterized surface phenotype of trophoblast-activated CD8+ T cells. CD8+ T cells activated by trophoblasts use the αβ TCR and show an up-regulation of the mucosal markers CD101 and CD103 (Fig. 6⇓). In addition, these cells do not express detectable CTLA-4, the NK marker CD56, or Fas ligand (FasL) (Fig. 6⇓). Cytotoxic T cells may also initiate apoptotic programs via Fas-FasL. These data further support the notion that trophoblast-activated CD8+ regulatory T cells do not suppress immune responses by cytotoxicity. Interestingly, in contrast to the CD8+ regulatory T cells our laboratory characterized in the intestine, these cells express high levels of CD28. Differences between trophoblast- and IEC-activated regulatory CD8+ T cells in terms of regulatory function (inability of trophoblast-activated regulatory CD8+ T cells to suppress the MLR) and CD28 expression suggested that these two regulatory populations were, in fact, distinct. Phenotype of CD3+CD8+ T cells cocultured with trophoblasts. CFSE-labeled T cells were cocultured with trophoblasts for 7 days and analyzed by four-color flow cytometry. Top, Isotype control staining (left) and αβ TCR staining (right) gated on total CD3+CD8+ T cells. Bottom, CD3+CD8+ T cells were divided into proliferating and nonproliferating T cells based on CFSE staining. The left column shows histograms for nonproliferating CD3+CD8+CFSEhigh T cells. The right column shows histograms for proliferating CD3+CD8+ CFSElow T cells. This figure is representative of four experiments with similar results. To investigate this further, we examined the activation requirements of trophoblast-activated CD8+ regulatory T cells. The addition of mAb B9 to trophoblasts before coculture, compared with an isotype control mAb (msIgG1), consistently inhibited between 10 and 40% of the expansion of CD8+ T cells (Fig. 7⇓A). This is consistent with what was seen in T:IEC cocultures. Interestingly, in contrast to IEC-activated regulatory T cells, the addition of an anti-CD1d mAb (mAb D5) did not block the expansion of CD8+ T cells (Fig. 7⇓A) in trophoblast/T cell cocultures when compared with an isotype control. mAbs to classical class I MHC (mAb W6/32) did not inhibit CD8+ T cell proliferation in these cultures as well. Thus, trophoblast-activated T cells seemed to differ from IEC-activated regulatory T cells in their requirements for CD1d recognition, but remained dependent on costimulation through a member of the CEA family recognized by the B9 mAb, and are class I independent. Trophoblasts activate a restricted subset of regulatory CD8+ T cells. A, CD3+CD8+ T cell expansion in trophoblast cocultures can be inhibited consistently by the B9 mAb specific for a CEA subfamily member (n = 4), but not by the D5 mAb specific for CD1d (n = 3) or the W6/32 mAb (n = 3), a pan-MHC class I Ab. Percent inhibition indicates the percentage of CD3+CD8+CFSElow T cells with B9, D5, or W6/32 mAb divided by the percentage of CD3+CD8+CFSElow T cells induced to proliferate in cocultures with trophoblasts in the presence of the respective isotype control Abs. 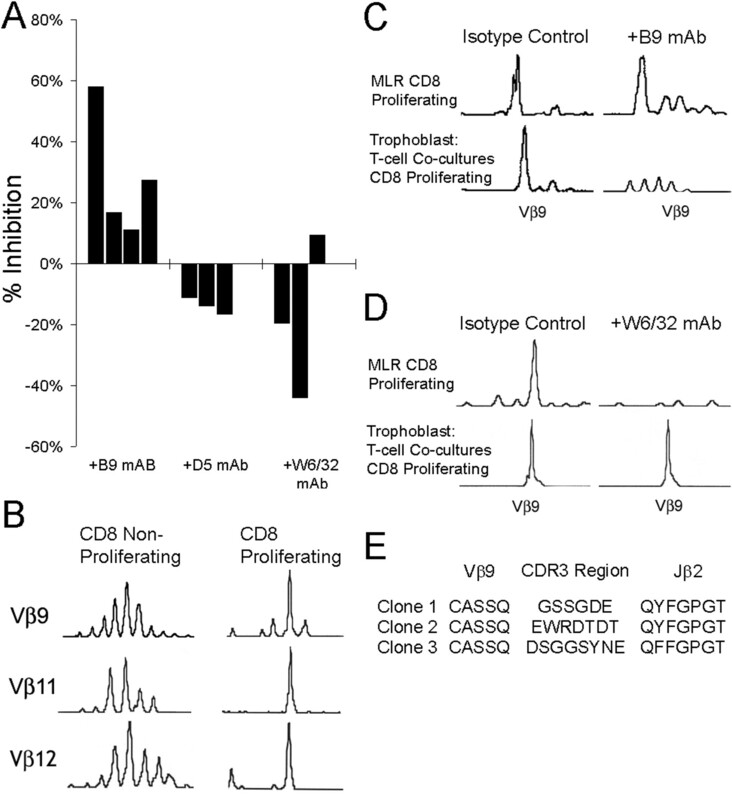 TCR repertoire of trophoblast-activated CD8+ T cells. B, Proliferating and nonproliferating CD3+CD8+ T cells from trophoblast T cell cocultures or conventional MLRs were sorted, and their TCR repertoire was examined by CDR3 display. CD3+CD8+ proliferating T cells showed oligoclonal expansion of T cells using Vβ9, Vβ11, and Vβ12 but not other Vβs (n = 15). One representative oligoclonal expansion is shown. C, Oligoclonal expansion of Vβ9 CD3+CD8+ T cells can be blocked by mAb B9 in trophoblast/T cell cocultures, but similar inhibition was not seen in the conventional MLR. D, Conversely, oligoclonal expansion of Vβ9 CD3+CD8+ proliferating T cells in the MLR can be blocked by the pan-MHC class I mAb W6/32, but not in trophoblast/T cell cocultures (n = 3). E, Sequencing of the CDR3 region of three Vβ9 TCR using CD8+ T cell clones from trophoblast/T cell cocultures revealed no common CDR3 length or motif. We next initiated studies assessing the restriction of the TCR repertoire in cells activated by trophoblasts. CD8+ regulatory T cells in the intestine show a restricted TCR repertoire usage, Vβ5.1/Vα18. T cells activated by freshly isolated human trophoblasts also show a limited but distinct Vβ repertoire. CD8+ T cells were sorted into populations of proliferating and nonproliferating cells based on CFSE intensity. RT-PCR using specific Vβ gene primers (CDR3 display) demonstrated oligoclonal expansions of Vβ9, Vβ11, and Vβ12 populations in proliferating CD8+ T cells (Fig. 7⇑B). In total, Vβ9+CD8+ T cells were found to be clonally expanded in 6 of 15, Vβ11 in 5 of 15, and Vβ12 in 5 of 15 cocultures. Interestingly, Vβ9 CD8+ T cell clones were dependent upon the CEA subfamily member for expansion because oligoclonal expansions could be blocked by the B9 Ab but not by either an Ab against MHC class I (Fig. 7⇑, C and D) or the D5 mAb (data not shown). In contrast, expansion of Vβ9 CD8+ T cell clones in MLR cultures were not inhibited by mAb B9, but could be inhibited by the anti-MHC class I mAb W6/32 (Fig. 7⇑, C and D). In several experiments, we sequenced the CDR3 region of CD8+Vβ9+-expressing T cells but were unable to demonstrate a common motif (Fig. 7⇑E), suggesting that the activation of these cells is, in part, Ag driven by distinct Ags. Thus, the difference in the CD8+ T cell population activated by trophoblasts vs IECs could be explained in part by the difference in CD1d dependence. Alternatively, there were also differences in the size of the protein in trophoblasts recognized by mAb B9 by Western blot (Fig. 1⇑D). We therefore sought to examine the nature of the molecule in the placenta recognized by the mAb B9 more closely. Lysates from early gestation placentae were resolved by SDS-PAGE and probed with Abs to CEA (CEACAM5), biliary glycoprotein (BGP) (CEACAM1), nonspecific cross-reacting Ag (NCA) (CEACAM6), and mAb B9. As shown in Fig. 8⇓A, only the F106-88 mAb (specific for NCA), and not the Co1–1 mAb (specific for CEA) or the 5F4 mAb (specific for BGP), identified a protein with an apparent molecular mass of ∼100 kDa similar to the band revealed by the B9 mAb (arrowheads). To determine whether this was the band initially identified by mAb B9 (Fig. 1⇑D), we performed immunoprecipitation studies using mAb B9. The immunoprecipitates were resolved by SDS-PAGE and transferred to nitrocellulose, and the membranes were probed with either mAb B9 or mAb F106-88. In both cases, a band of ∼100 kDa was detected (Fig. 8⇓B, arrows). Additional higher molecular mass bands were identified as well. Because CEA subfamily members can exhibit variable glycosylation patterns, these bands may represent posttranslational modifications of NCA (CEACAM6). B9 mAb recognizes NCA in placental lysates. A, Trophoblast lysates were subjected to Western blot analysis using the anti-CEA mAb (Col-1) and the anti-BGP mAb (5F4). No immunoreactive bands were detected in trophoblast lysates. The Col-1 mAb detects CEA in the IEC cell line, T84, and the 5F4 mAb detects BGP in both resting and anti-CD3-stimulated T cells. Western blot analysis using the F106-88 mAb reveals a band of ∼100 kDa similar to that seen with the B9 mAb (arrowheads). B, Trophoblast lysates were immunoprecipitated with the B9 mAb, and then resolved by SDS-PAGE. Western blotting with the B9 mAb and the NCA mAb reveals bands of the same molecular mass at ∼80–100 kDa (arrows). Taken together, these data suggest that the differences in CD8+ T cells activated by trophoblasts from those present in the intestine reflect differences in the CEA subfamily member (NCA in the case of trophoblasts, and CEA in the case of IECs) and the requirement for CD1d. The differences are also seen in distinct TCR gene usage, cellular phenotype, and function. The observation that particular Vβ-expressing T cells were consistently expanded in in vitro cocultures provided a means to search for these cells in vivo. Peripheral blood CD8+ T cells from pregnant women in their 16th to 29th wk of gestation were isolated and analyzed by a panel of Vβ-specific Abs. We defined expansion of a specific Vβ family if the percentage of these cells was >3 SDs above the mean of the controls. Intriguingly, 3 of 12 patients manifested significant expansions in CD8+Vβ9+ T cells consistent with our in vitro data (Table I⇓). A similar analysis was undertaken in term placenta (Table I⇑). Lymphocytes isolated from term placenta did not show a significant difference in the percentage of CD8+Vβ9 T cells as compared with the percentages found in normal peripheral blood. As mentioned above, term placentae do not express the necessary costimulatory molecule recognized by the B9 mAb (Fig. 1⇑C), and thus may not facilitate the expansion of Vβ9+CD8+ T cells. Increasing evidence implicates an immunological component to fetal tolerance. Several studies have demonstrated that the maternal immune system recognizes the semi-allogeneic fetus, but that it remains in a quiescent state (26, 27). The potential mechanisms underlying this phenomenon are likely to be complex and may involve several complementary or overlapping pathways to favor reproductive success. A cellular barrier comprised of placental trophoblasts separates a mother and her child. This arrangement would seem to implicate trophoblasts as a potential regulator of the immune environment at the maternal-fetal interface. Indeed, trophoblasts can influence the immune system during pregnancy through their expression of soluble and cell surface-associated immunomodulatory molecules. For example, trophoblasts secrete IDO, which limits the availability of the essential amino acid tryptophan, consequently limiting lymphocyte proliferation (28, 29). Normal human trophoblasts also lack the expression of MHC class II and the classical class I restriction elements HLA-A and HLA-B (2), but similar to IEC, express a variety of nonclassical class I molecules. Our laboratory has focused on a subset of regulatory T cells, the CD8+ regulatory T cell. These cells were described originally in the intestine where they are activated by an interaction with IEC through a combination of the nonclassical class I molecule CD1d and a costimulatory molecule of the CEA family recognized by the B9 mAb (11, 23). CD1d has been reported to be expressed by trophoblasts during the early stages of pregnancy (10). We have extended these observations by demonstrating that CD1d mRNA is temporally regulated during the first trimester, with increasing expression from 7 to 12 wk of gestation. Trophoblasts also express a form of the costimulatory molecule recognized by the mAb B9. Furthermore, similar to IEC, isolated trophoblasts preferentially activate clonal populations of CD8+ T cells. However, in contrast to IEC, CD8+ T cell expansion by trophoblasts appears to be independent of CD1d, and the CEA subfamily member expressed by these cells appears to be distinct. Western blot analysis suggests that the protein recognized by the B9 mAb in trophoblasts is NCA (CEACAM6), whereas in the intestine, mAb B9 recognizes CEA. CEA and NCA share 85% sequence homology at the amino acid level within the IgV-like N domain and IgC-like A1 and B1 domains (30). Some evidence has already suggested that CEA and NCA might have similar functions (31), and we provide further evidence for functional similarity between the two molecules. Furthermore, the inability of the anti-CD1d mAb and a pan-MHC class I Ab to block CD8+ expansion in trophoblast cocultures, but not in the MLR (class I only), suggests that NCA recognized by mAb B9 in trophoblasts may be acting in conjunction with another nonclassical class I molecule. In concert with these data, CD8+ T cells expanding in trophoblast cocultures use a limited TCR repertoire including Vβ9. The absence of an invariant TCR gene sequence in different cocultures speaks to the role of distinct Ags driving the response. Similar to regulatory CD8+ T cells in the intestine, trophoblast-activated CD8+ T cells express mucosal markers and efficiently suppress in vitro Ab production in an Ag-nonspecific manner by cell contact. Several groups have shown an association of aberrant Ab responses with recurrent spontaneous abortion. The lupus anticoagulant and anticardiolipin Abs are present in 1–3% of normal pregnancies but are markedly elevated in patients with recurrent fetal loss (32, 33). CD8+ T cells are present at the maternal/fetal interface, albeit at low numbers (34, 35). Furthermore, Yeaman et al. 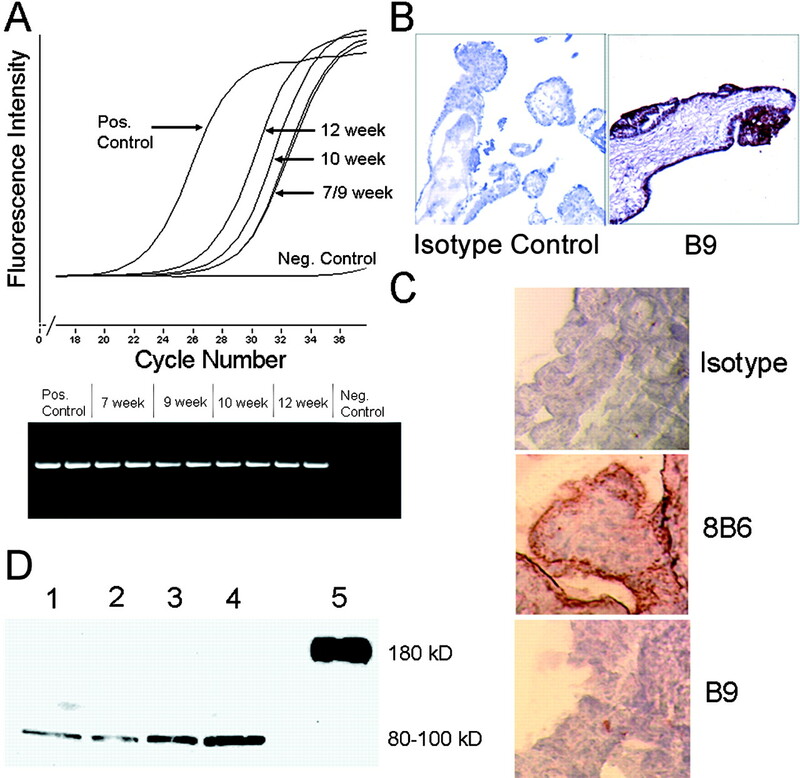 (36, 37) recently described uterine lymphoid aggregates consisting of predominantly CD8+ T cells and B cells in close association during the proliferative phase of the estrous cycle. Indeed, Kemeny and colleagues (38, 39, 40) have demonstrated that CD8+ T cells can inhibit IgE secretion and have a regulatory role in allergic airway disease models. Additionally, CD8+ suppressor T cells have also been implicated in controlling systemic lupus erythematosus (41), an Ab-mediated autoimmune disorder, as well as suppressing thyrotropin receptor-specific HLA-DQA*0501-restricted CD4+ T cells that may be linked to the development of Grave’s disease (42). This suggests the possibility that, in vivo, CD8+ T cell subsets may have a role in regulating B cells, potentially protecting the fetus from deleterious Ab effects. However, trophoblast-activated CD8+ T cells do not act as third-party suppressor cells in allogeneic MLRs. This is in contrast to other regulatory cell populations such as the naturally occurring CD4+CD25+ regulatory T cell. One caveat is that CD4+CD25+ regulatory T cells that can suppress allogeneic mixed lymphocyte only do so at E:T ratios of 1:2 or greater (43, 44). This calls into question the physiologic relevance of these assays, because CD4+CD25+ regulatory T cells have been shown to represent at most 5% of circulating T cells in humans (45). In contrast, trophoblast-activated CD8+ T cells suppress Ab production at E:T ratios of 1:8, a number more consistent with a potential role in vivo. Because trophoblast-activated CD8+ T cells express CD28, one possible mechanism of suppression is through perforin-dependent cytolytic activity or Fas-FasL interactions. However, this is unlikely to be the case, given that trophoblast-activated CD8+ T cells do not express FasL or CTLA-4 and do not show appreciable cytolytic activity in a redirected lysis assay. Contact-dependent, Ag-nonspecific regulatory mechanisms have been demonstrated for other regulatory T cell subsets. For example, CD4+CD25+ regulatory T cells may exert part of their regulatory activity through the expression of cell surface-associated TGF-β (46). Expansions of paternal Ag-specific CD8+ T cells in the peripheral blood of pregnant women have been reported previously. Additionally, these cells also demonstrate greater oligoclonality than CD8+ T cells isolated from nonpregnant controls (47, 48). Indeed, we have shown a small population of pregnant women with significant populations of Vβ9 CD8+ T cells, signaling a possible role for CD8+ regulatory T cells in vivo. Mucosal surfaces such as the intestine are subject to constant antigenic challenge and have developed specific mechanisms for controlling immune responses including the activation of regulatory T cells. Similarly, the uterus may face a persistent, albeit temporary, antigenic challenge in the form of a semi-allogeneic fetus. Trophoblasts are anatomically poised to serve as modulators of the maternal immune system during pregnancy. We postulate that the regulatory CD8+ T cells described in this study may represent one of several subsets of regulatory T cells that exist during pregnancy. Indeed, in mouse models, both CD4+ and CD8+ T cells have regulatory effects during pregnancy. Mouse models in which there is a deficiency in CD4+CD25+ regulatory T cells have significant fetal resorption during allogeneic but not syngeneic matings (14). Likewise, CD8+ T cell depletion studies demonstrate that CD8+ T cells are critical in regulating the CBA/J × DBA/2 model of spontaneous abortion in mice (49, 50). In humans, the role for the various regulatory subsets are unknown. Although CD4+CD25+ regulatory T cells are expanded in the peripheral blood and decidua of pregnant women (15), the physiologic role of these cells in pregnancy has not been characterized fully. In this study, we explored the possibility that trophoblasts could modulate the immune system through an interaction with CD8+ T cells. The specificity of trophoblast-activated CD8+ T cell for regulating T cell-dependent B cell responses and the efficiency at which these cells are able to suppress Ig secretion suggests that these cells may occupy a regulatory niche during pregnancy. Overall, CD8+ regulatory T cells may contribute to the complex immune regulation that must occur during pregnancy. We thank I. George for technical assistance with flow cytometry and cell sorting, T. Moran for assistance with the redirected lysis assay, and P. Cortes, G. Randolph, and members of the Mayer laboratory for their helpful advice and discussions. ↵1 This work was supported by Public Health Service Grants AI23504, AI24671, AI44236, and AI07605 (to L.M.). ↵3 Abbreviations used in this paper: CEA, carcinoembryonic Ag; IEC, intestinal epithelial cell; FasL, Fas ligand; BGP, biliary glycoprotein; NCA, nonspecific cross-reacting Ag. Koch, C. A., J. L. Platt. 2003. Natural mechanisms for evading graft rejection: the fetus as an allograft. Springer Semin. Immunopathol. 25: 95-117. Blaschitz, A., H. Hutter, G. Dohr. 2001. HLA class I protein expression in the human placenta. Early Pregnancy 5: 67-69. Hutter, H., A. Hammer, A. Blaschitz, M. Hartmann, P. Ebbesen, G. Dohr, A. Ziegler, B. Uchanska-Ziegler. 1996. Expression of HLA class I molecules in human first trimester and term placenta trophoblast. Cell Tissue Res. 286: 439-447. King, A., C. Boocock, A. M. Sharkey, L. Gardner, A. Beretta, A. G. Siccardi, Y. W. Loke. 1996. Evidence for the expression of HLAA-C class I mRNA and protein by human first trimester trophoblast. J. Immunol. 156: 2068-2076. King, A., T. D. Burrows, S. E. Hiby, J. M. Bowen, S. Joseph, S. Verma, P. B. Lim, L. Gardner, P. Le Bouteiller, A. Ziegler, et al 2000. Surface expression of HLA-C antigen by human extravillous trophoblast. Placenta 21: 376-387. King, A., D. S. Allan, M. Bowen, S. J. Powis, S. Joseph, S. Verma, S. E. Hiby, A. J. McMichael, Y. W. Loke, V. M. Braud. 2000. HLA-E is expressed on trophoblast and interacts with CD94/NKG2 receptors on decidual NK cells. Eur. J. Immunol. 30: 1623-1631. Hiby, S. E., A. King, A. Sharkey, Y. W. Loke. 1999. Molecular studies of trophoblast HLA-G: polymorphism, isoforms, imprinting and expression in preimplantation embryo. Tissue Antigens 53: 1-13. Loke, Y. W., A. King, T. Burrows, L. Gardner, M. Bowen, S. Hiby, S. Howlett, N. Holmes, D. Jacobs. 1997. Evaluation of trophoblast HLA-G antigen with a specific monoclonal antibody. Tissue Antigens 50: 135-146. Rouas-Freiss, N., R. M. Goncalves, C. Menier, J. Dausset, E. D. Carosella. 1997. Direct evidence to support the role of HLA-G in protecting the fetus from maternal uterine natural killer cytolysis. Proc. Natl. Acad. Sci. USA 94: 11520-11525. Boyson, J. E., B. Rybalov, L. A. Koopman, M. Exley, S. P. Balk, F. K. Racke, F. Schatz, R. Masch, S. B. Wilson, J. L. Strominger. 2002. CD1d and invariant NKT cells at the human maternal-fetal interface. Proc. Natl. Acad. Sci. USA 99: 13741-13746. Toy, L. S., X. Y. Yio, A. Lin, S. Honig, L. Mayer. 1997. Defective expression of gp180, a novel CD8 ligand on intestinal epithelial cells, in inflammatory bowel disease. J. Clin. Invest. 100: 2062-2071. Bach, J. F., B. J. Francois. 2003. Regulatory T cells under scrutiny. Nat. Rev. Immunol. 3: 189-198. Aluvihare, V. R., M. Kallikourdis, A. G. Betz. 2004. Regulatory T cells mediate maternal tolerance to the fetus. Nat. Immunol. 5: 266-271. Sasaki, Y., M. Sakai, S. Miyazaki, S. Higuma, A. Shiozaki, S. Saito. 2004. Decidual and peripheral blood CD4+CD25+ regulatory T cells in early pregnancy subjects and spontaneous abortion cases. Mol. Hum. Reprod. 10: 347-353. Heikkinen, J., M. Mottonen, A. Alanen, O. Lassila. 2004. Phenotypic characterization of regulatory T cells in the human decidua. Clin. Exp. Immunol. 136: 373-378. Bloxam, D. L., C. M. Bax, B. E. Bax. 1997. Culture of syncytiotrophoblast for the study of human placental transfer. Part I. Isolation and purification of cytotrophoblast. Placenta 18: 93-98. Bloxam, D. L., B. E. Bax, C. M. Bax. 1997. Culture of syncytiotrophoblast for the study of human placental transfer. Part II: Production, culture and use of syncytiotrophoblast. Placenta 18: 99-108. Yio, X. Y., L. Mayer. 1997. Characterization of a 180-kDa intestinal epithelial cell membrane glycoprotein, gp180: a candidate molecule mediating T cell-epithelial cell interactions. J. Biol. Chem. 272: 12786-12792. Than, S., M. Kharbanda, V. Chitnis, S. Bakshi, P. K. Gregersen, S. Pahwa. 1999. Clonal dominance patterns of CD8 T cells in relation to disease progression in HIV-infected children. J. Immunol. 162: 3680-3686. Simister, N. E., C. M. Story, H. L. Chen, J. S. Hunt. 1996. An IgG-transporting Fc receptor expressed in the syncytiotrophoblast of human placenta. Eur. J. Immunol. 26: 1527-1531. Li, Y., X. Y. Yio, L. Mayer. 1995. Human intestinal epithelial cell-induced CD8+ T cell activation is mediated through CD8 and the activation of CD8-associated p56lck. J. Exp. Med. 182: 1079-1088. Kitani, A., K. Chua, K. Nakamura, W. Strober. 2000. Activated self-MHC-reactive T cells have the cytokine phenotype of Th3/T regulatory cell 1 T cells. J. Immunol. 165: 691-702. Jacquot, S., T. Kobata, S. Iwata, S. F. Schlossman, C. Morimoto. 1997. CD27/CD70 interaction contributes to the activation and the function of human autoreactive CD27+ regulatory T cells. Cell. Immunol. 179: 48-54. Tafuri, A., J. Alferink, P. Moller, G. J. Hammerling, B. Arnold. 1995. T cell awareness of paternal alloantigens during pregnancy. Science 270: 630-633. Zhou, M., A. L. Mellor. 1998. Expanded cohorts of maternal CD8+ T-cells specific for paternal MHC class I accumulate during pregnancy. J. Reprod. Immunol. 40: 47-62. Munn, D. H., M. Zhou, J. T. Attwood, I. Bondarev, S. J. Conway, B. Marshall, C. Brown, A. L. Mellor. 1998. Prevention of allogeneic fetal rejection by tryptophan catabolism. Science 281: 1191-1193. Sedlmayr, P., A. Blaschitz, R. Wintersteiger, M. Semlitsch, A. Hammer, C. R. MacKenzie, W. Walcher, O. Reich, O. Takikawa, G. Dohr. 2002. Localization of indoleamine 2,3-dioxygenase in human female reproductive organs and the placenta. Mol. Hum. Reprod. 8: 385-391. Neumaier, M., W. Zimmermann, L. Shively, Y. Hinoda, A. D. Riggs, J. E. Shively. 1988. Characterization of a cDNA clone for the nonspecific cross-reacting antigen (NCA) and a comparison of NCA and carcinoembryonic antigen. J. Biol. Chem. 263: 3202-3207. Leusch, H. G., S. A. Hefta, Z. Drzeniek, K. Hummel, Z. Markos-Pusztai, C. Wagener. 1990. Escherichia coli of human origin binds to carcinoembryonic antigen (CEA) and non-specific crossreacting antigen (NCA). FEBS Lett. 261: 405-409. Harris, E. N., J. A. Spinnato. 1991. Should anticardiolipin tests be performed in otherwise healthy pregnant women?. Am. J. Obstet. Gynecol. 165: 1272-1277. Lockwood, C. J., R. Romero, R. F. Feinberg, L. P. Clyne, B. Coster, J. C. Hobbins. 1989. The prevalence and biologic significance of lupus anticoagulant and anticardiolipin antibodies in a general obstetric population. Am. J. Obstet. Gynecol. 161: 369-373. Slukvin, I. I., V. P. Chernyshov, A. A. Merkulova, M. A. Vodyanik, A. K. Kalinovsky. 1994. Differential expression of adhesion and homing molecules by human decidual and peripheral blood lymphocytes in early pregnancy. Cell. Immunol. 158: 29-45. Dietl, J., P. Ruck, H. P. Horny, R. Handgretinger, K. Marzusch, M. Ruck, E. Kaiserling, H. Griesser, D. Kabelitz. 1992. The decidua of early human pregnancy: immunohistochemistry and function of immunocompetent cells. Gynecol. Obstet. Invest. 33: 197-204. Thomas, M. J., A. Noble, E. Sawicka, P. W. Askenase, D. M. Kemeny. 2002. CD8 T cells inhibit IgE via dendritic cell IL-12 induction that promotes Th1 T cell counter-regulation. J. Immunol. 168: 216-223. Huang, T. J., P. A. MacAry, D. M. Kemeny, K. F. Chung. 1999. Effect of CD8+ T-cell depletion on bronchial hyper-responsiveness and inflammation in sensitized and allergen-exposed Brown-Norway rats. Immunology 96: 416-423. Thomas, M. J., P. A. MacAry, D. M. Kemeny. 1999. 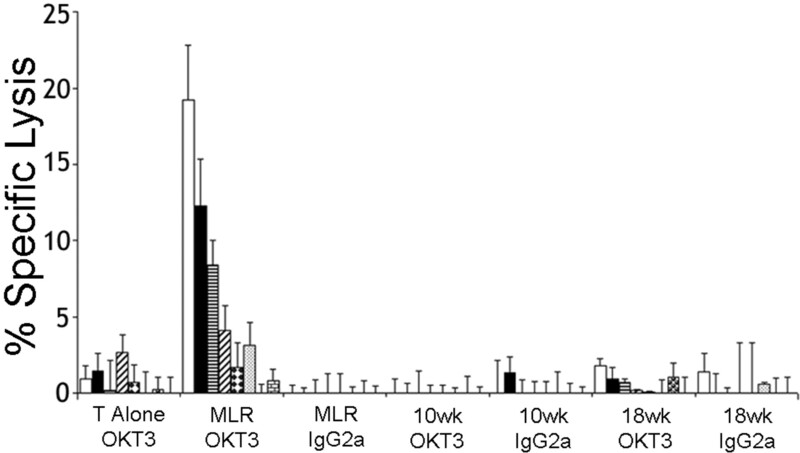 CD8 T-lymphocyte-mediated regulation of ovalbumin-specific murine IgE responses. Int. Arch. Allergy Immunol. 118: 289-291. Molteni, M., C. Rossetti, S. Scrofani, P. Bonara, R. Scorza, L. D. Kohn. 2003. Regulatory CD8+ T cells control thyrotropin receptor-specific CD4+ clones in healthy subjects. Cancer Detect. Prev. 27: 167-174. Nakamura, K., A. Kitani, W. Strober. 2001. Cell contact-dependent immunosuppression by CD4+CD25+ regulatory T cells is mediated by cell surface-bound transforming growth factor-β. J. Exp. Med. 194: 629-644. Hoger, T. A., M. Tokuyama, K. Yonamine, K. Hayashi, K. Masuko-Hongo, T. Kato, T. Kobata, Y. Mizushima, K. Nishioka, K. Yamamoto. 1996. Time course analysis of α+β+ T cell clones during normal pregnancy. Eur. J. Immunol. 26: 834-838. Iwatani, Y., N. Amino, J. Tachi, M. Kimura, I. Ura, M. Mori, K. Miyai, M. Nasu, O. Tanizawa. 1988. Changes of lymphocyte subsets in normal pregnant and postpartum women: postpartum increase in NK/K (Leu 7) cells. Am. J. Reprod. Immunol. Microbiol. 18: 52-55. Clark, D. A., G. Chaouat, R. Mogil, T. G. Wegmann. 1994. Prevention of spontaneous abortion in DBA/2-mated CBA/J mice by GM-CSF involves CD8+ T cell-dependent suppression of natural effector cell cytotoxicity against trophoblast target cells. Cell. Immunol. 154: 143-152. Blois, S. M., R. Joachim, J. Kandil, R. Margni, M. Tometten, B. F. Klapp, P. C. Arck. 2004. Depletion of CD8+ cells abolishes the pregnancy protective effect of progesterone substitution with dydrogesterone in mice by altering the Th1/Th2 cytokine profile. J. Immunol. 172: 5893-5899.